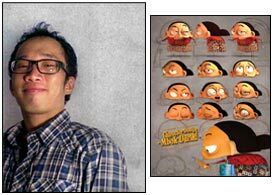 He describes himself as an animator, illustrator, and concept artist. Mbok Darmi Sukabrantah born on February 29, 1956. Yes, The Mbok birthday once every four years. Mbok Darmi petite but energetic and vivacious. Everyday, Mbok Darmi dressed in traditional Javanese kebaya and jarik.